There is no shortage of bad chocolate cake in the world. You know the type, dry, bland, with tasteless icing that somehow manages to also be cloying. Well, say goodbye to cake like that and say hello to the chocolate cake you always hope you’ll get when you’re handed a slice. 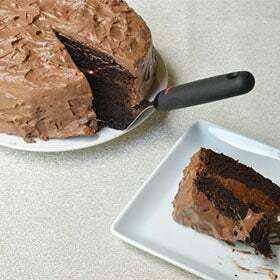 This cake is heavily inspired by the original Hershey’s chocolate cake recipe, a fan favorite, but tweaked to make it, dare we say it, even better. Yum! Preheat oven to 350°F. 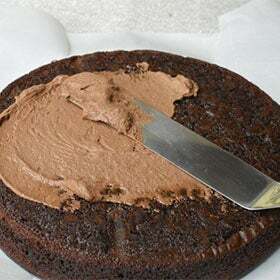 Prepare two 9-inch cake pans by greasing and lining the bottoms with parchment paper. 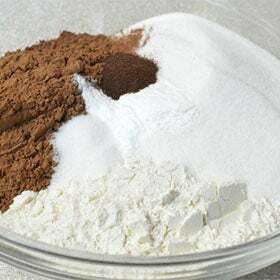 Combine all the dry ingredients—flour, sugar, cocoa powder, baking powder, baking soda, salt, espresso powder—in a large bowl and whisk until combined. 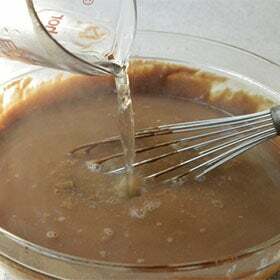 Add the milk, vegetable oils, eggs, and vanilla extract and whisk until well blended. Don’t give in to the temptation to substitute butter for the oil. The oil gives the cake its irresistible moistness. Carefully mix in the boiling water. 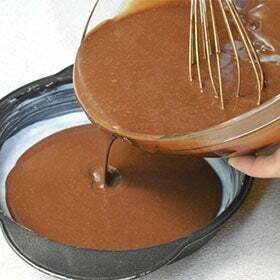 The hot water acts as an activator for the cocoa powder and will give your cake a rich, nuanced chocolate flavor. 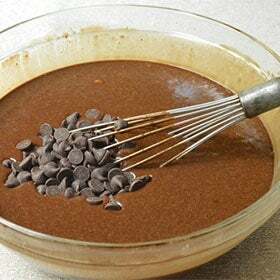 Add the chocolate chips to the cake batter either before you pour it into the pans or sprinkle them into each pan after. Either way, the chocolate chips will most likely sink to the bottom, giving your cake some interesting layers. Bake for 30-35 minutes, until a toothpick or knife inserted in the middle comes out clean. 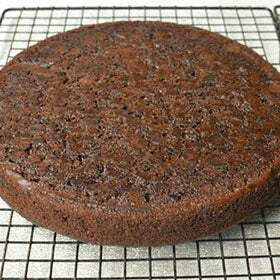 Allow cakes to cool fully before frosting. Good frosting is neither too sweet, nor too buttery and has plenty of real flavor. 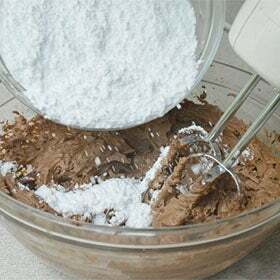 This frosting is the perfect combination and the ideal complement to our amazing chocolate cake recipe. 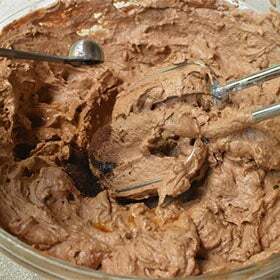 Cream butter and cocoa powder together until smooth and silky. Add about a third of the confectioner’s sugar and blend well. Then add about a third of the milk and blend well. 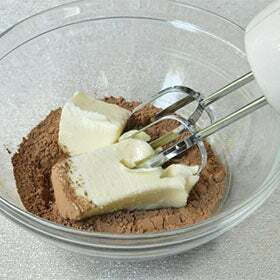 Whisk for two minutes. Add another third of the confectioner’s sugar and blend well. Add another third of the milk and blend well. Whisk for another two minutes. Add the remaining sugar and blend. Only add the rest of the milk if the frosting looks a little dry. 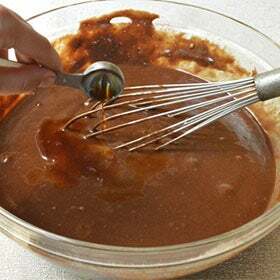 Add the vanilla extract and espresso powder and whisk until fluffy. If the frosting appears too dry at this point, add a little more milk. 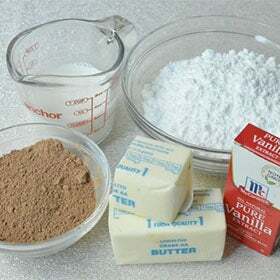 If the frosting appears too wet, add a little more confectioner’s sugar. When the cakes are cool, apply frosting liberally. Then, refrigerate until ready to serve. Enjoy!